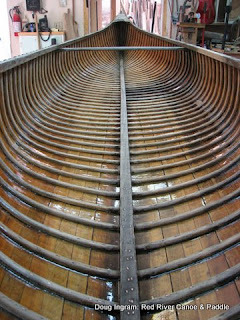 Here is the Peterborough Lake Queen finally finished, all clean, and ready for finishes. The dark on the right side is were an old repair was done back in the '40's, instead of using white cedar, red cedar was used. After 2 coats of epoxy for sealer. 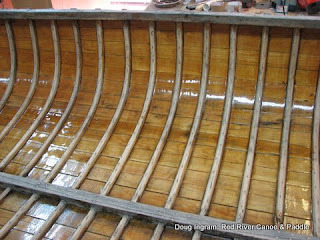 This canoe won't be used much, so the epoxy is used to seal the wood and the seams under the varnish. The colour is restored! The ribs do not yet have any finish on them. 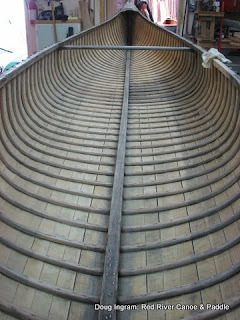 The varnish will make them look much like the planking. Posted by Doug Ingram at 8:50 p.m.